A newly revised air services agreement between Mexico and the US that eases limits on the number of airlines allowed to operate on routes between the two countries is a welcome development for airlines operating in both regions. But it is particularly interesting for Mexico’s airlines given that their penetration in the transborder space still pales in comparison to US airlines operating between the two countries. The new pact does not take effect until Jan-2016, which means that the lifting of restrictions is some way in the future. But in the meantime Mexico’s airlines still have ample opportunity under the existing agreement, and are no doubt evaluating new opportunities created by the new air services arrangement. Mexico and the US struck the new accord as all of Mexico’s airlines are making a transborder push to diversify from the domestic market, which has been weaker the last couple of years due to Mexico’s sluggish economy. Key to the execution of the expansion is ensuring demand is robust enough in transborder markets in order to maintain favourable yields on those routes. The changes to the air services agreement between Mexico and the US remove the restrictions of only two airlines from each country receiving authorisation to operate on city pairs between the two countries. There are certain markets under the current pact that allow for three airlines from each country including Acapulco, Cancun, Cozumel, Guadalajara, Huatulco, Ixtapa, Loreto, Manzanillo, Mazatlan, Merida, Monterrey, Oaxaca, Puerto Vallarta and San Jose del Cabo. Both the new agreement and the planned new airport in Mexico City could be pivotal in allowing airlines expanded access to Mexico. The two-phase construction of the new airport should ease congestion at Mexico City Juarez and allow all airlines increased access to the important Mexico City market. But in the meantime, Mexico’s airlines are looking to build on their current transborder expansion now that city pair restrictions are being eased in roughly a year. Airlines are still expanding under the existing air services agreement as Mexico’s airlines look to diversify from the weaker domestic market and US airlines opt to shift capacity from underperforming markets. 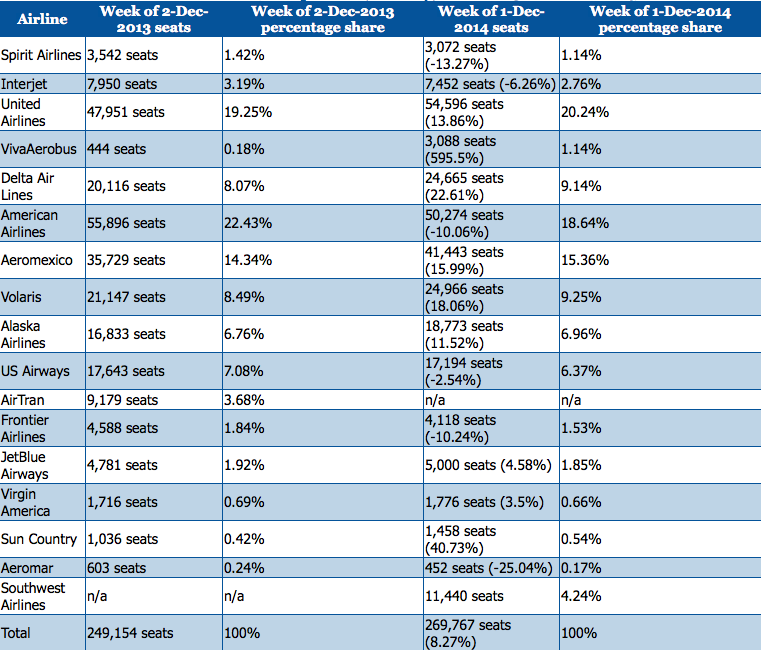 Data from CAPA and OAG show that for the week of 1-Dec-2014 total seats deployed between Mexico and the US have risen by 8%. 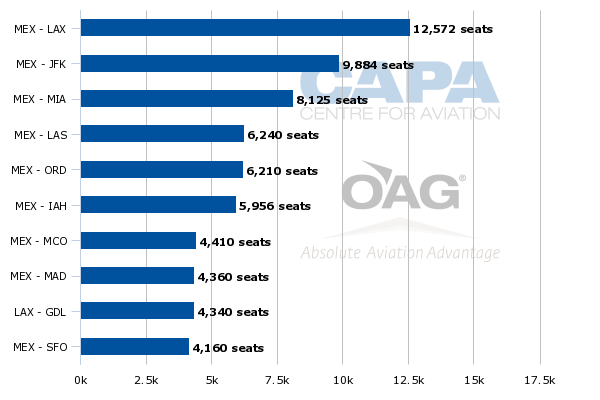 Although major US airlines still dominate overall seat allotment between the two countries – United’s seats have grown 14% year-on-year, Delta’s 23% and Alaska’s 11.5% – Mexican airlines are also expanding quickly into transborder markets. Aeromexico’s seats between Mexico and the US are up 16% year-on-year and Volaris has recorded an 18% increase. 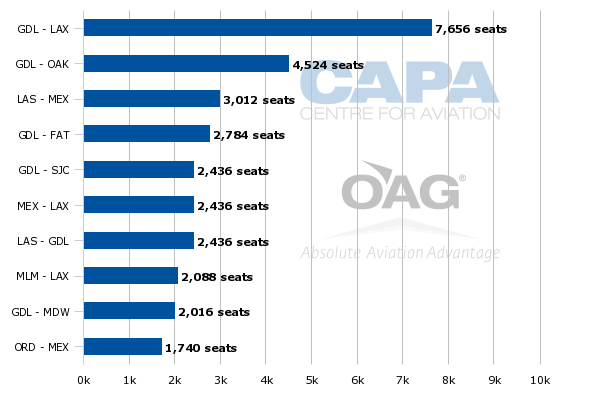 VivaAerobus is still a small player in the transborder space, but its seat deployment has jumped nearly 600% year-on-year. The airline is in the midst of a new transborder expansion in 2H2014 that entails the launch of flights from Monterrey to San Antonio and Las Vegas and between Houston Intercontinental and Guadalajara and Cancun. See related report: VivaAerobus plans a transborder push. Is this the start of a new phase for Mexico’s quieter LCC? Although foreign airlines still dominate international passenger traffic to Mexico, the country’s airlines are logging significant growth in international markets, which are largely tilted toward US transborder routes. Data from Mexico’s DGAC show that foreign airlines transported 20 million international passengers during the first 10 months of 2014, a 7.5% increase year-on-year. But Mexican airlines grew their international passenger numbers at a faster clip, increasing the number of international passengers transported 14.5% year-on-year. During the month of Oct-2014 (the latest data available) Volaris recorded a 13.5% increase in international passengers year-on-year, Aeromexico increased its international passengers by 11% and Interjet recorded an 8% increase. VivaAerobus had a 74% increase jump, but that reflects its re-entering of the US transborder market during 2H2014. Volaris has introduced several new routes to the US during CY2014 including Guadalajara and Chihuahua to Denver, Guadalajara to Portland and Guadalajara to Reno, Nevada in Dec-2014. During that same month Volaris is also introducing service from Guadalajara and Mexico City to Fort Lauderdale. Previously, Volaris has remarked that its strategy in the US transborder markets is to target VFR traffic, concluding those markets have lower levels of competition. Given the operating restrictions at Juarez, most of Volaris’ top international routes originate in Guadalajara, and many of the route pairings have room for another Mexican airline under the current bilateral. The exceptions are Guadalajara to Chicago O’Hare, Los Angeles, Fresno and Sacramento served by both Volaris and Aeromexico, and Guadalajara to San Antonio, which is operated by Volaris and Interjet. Volaris also operates service from Guadalajara to Denver, Chicago Midway, Orlando, San Diego, Las Vegas and Fort Lauderdale. As previously reported by CAPA, Aeromexico and Volaris seem to be co-existing in transborder markets as Aeromexico’s headquarters and largest base is Mexico City Juarez. All of Aeromexico’s top international markets originate at Juarez, and Volaris operates in four of those markets – Los Angeles, Las Vegas, Chicago O’Hare and Orlando. Interjet operates service from Mexico City to Miami. Between the slot restrictions at Juarez and the current Mexico-US bilateral remaining in place until Jan-2016, other Mexican airlines are essentially shut out of operating in some of the largest US transborder markets. Aeromexico's transborder growth is largely concentrated on a new banking structure it is creating at Juarez to leverage connections to its network in Mexico and Latin America. Despite the constraints at Juarez, there are other opportunities outside of Mexico City to add new transborder routes. Both Interjet and VivaAerobus are following the lead of Aeromexico and Volaris by adding new international service as Mexico’s economy remains tenuous. VivaAerobus has started a fleet renewal with new Airbus A320s that give the airline a much more economical vehicle to operate transborder flights versus its Boeing 737 classics. VivaAerobus has indicated that more new international routes could be in the offing from its headquarters and main base in Monterrey in CY2015. 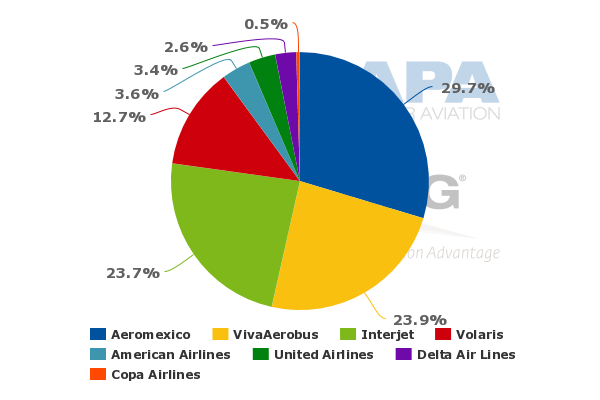 VivaAerobus is the second largest airline in Monterrey measured by seat deployment with 24% share compared with Aeromexico’s 30% share. VivaAerobus presently serves two other transborder markets from Monterrey – Las Vegas and San Antonio – both of which are served by Aeromexico and Interjet. Presently, other international markets available from Monterrey include Chicago O’Hare (served by United), Dallas/Fort Worth (operated by American) and Detroit (operated by Delta). Those may seem like logical markets for VivaAerobus if it can leverage strong point of sale in Monterrey through its traffic stimulation strategy of offering lower fares. 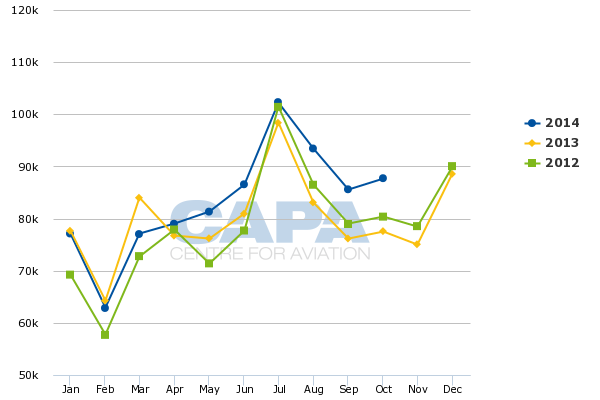 Monterrey’s international traffic has grown steadily each month during CY2014, with the exception of Mar-2014 when international passenger traffic fell 8%. During Oct-2014 its international passenger numbers jumped 13%. Interjet remains something of an unknown in the transborder space. It is only one of the Mexican low-cost airlines that has launched operations during the last decade to operate international flights outside the US transborder market. It presently serves Havana, Guatemala and Bogota in addition to its transborder service to New York JFK, San Antonio, Las Vegas and Houston. Unlike VivaAerobus and Volaris, who have adopted a more pure LCC model, Interjet is more a hybrid airline that targets a mix of business and leisure travellers. So its transborder offerings might be more limited given the passenger segments it targets. Interjet is the second largest airline at Mexico City Juarez, but slots are limited at the airport and Volaris and Aeromexico have a lock on some of the larger transborder markets. Mexico City is Interjet’s largest base by a significant margin, so it may choose to leverage its slots at the airport in other markets besides transborder routes. But there are opportunities to leverage business travellers from both Monterrey and Guadalajara in other transborder markets, and Interjet’s flights from Monterrey to Houston could be a test case for leveraging additional transborder service outside of Mexico City. It presently serves San Antonio, JFK and Miami from Mexico City Juarez, and also operates flights from Guadalajara to San Antonio. It offers flights to Las Vegas from Mexico City Toluca and Monterrey. Given that up to three Mexican airlines can operate transborder service from Monterrey and space is available on service from Guadalajara, there are opportunities for all airlines under the existing Mexico-US bilateral; it depends on passenger demand. Despite the progress in lifting some restrictions in the current agreement covering air service between Mexico and the US, the status quo remains in place for the next year. During that time airlines from both countries will work to leverage transborder demand and examine the implications of the new agreement. For Mexican airlines opting to deploy more capacity into transborder markets to ease the effects of weak domestic demand, the challenge is ensuring that US routes do not fall victim to oversupply. Over the long term, they need to evaluate how best to exploit new market opportunities created by the easing of some bilateral restrictions.